Tomorrow, Hewlett-Packard is launching the newest version of its HP Envy 17 with 3-D capabilities, alongside the new HP Envy 15 and Envy 17 notebook PCs, available through HP Direct. As the technology gets more advanced, more 3-D laptops are expected to come to market with autostereoscopic (glasses-free) screens. Toshiba, for example, recently introduced the Qosmio F750 (in Europe) and Qosmio F755 (North America); both laptops run Windows 7 and feature a 15.6-inch Toshiba TruBrite 1080p autostereoscopic 3-D display. But most 3-D laptops — such as the Sony VAIO F 3D, the Origin EON15 3D, the Dell Alienware M17x R3 and the Dell XPS 17 with optional 3-D screen — currently have stereoscopic screens, which means users have to wear glasses to experience the 3-D effect. Nvidia’s 3D Vision kit is commonly bundled with these laptops and includes a pair of the necessary glasses, as well as a 3-D vision USB controller/emitter. 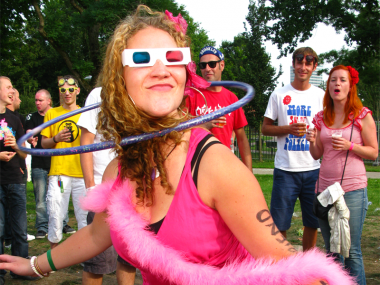 The kinds of glasses consumers are supposed to wear vary, as well: There’s the “active” kind versus the “passive” kind. Nvidia’s 3-D glasses, for example, are active-shutter lenses (read: battery-operated) that create the 3-D image by rapidly shuttering the left eye and then the right eye. Passive — a.k.a. polarized — 3-D glasses are cheaper, look a lot like sunglasses, and work by allowing different levels of light into each eye. Note that these are different from the anaglyph cardboard glasses you might have worn at the movies as a kid. So, if the 3-D viewing doesn’t give you a headache, the lack of standardization in this industry just might. Content: It’s the chicken-or-the-egg problem: Hardware makers can’t sell 3-D products well without enough 3-D content for people to watch and play; content creators are hesitant to invest in making 3-D material when the format hasn’t yet been adopted on a mass scale. But games may indeed be the shining star when it comes to 3-D on PCs. Game developers have been creating games with inherent 3-D capabilities for many years now; consumers just didn’t have the display options they now have to view the games. And 3-D PCs often include super-fast graphics cards that are optimal for game viewing. In terms of content volume, Nvidia says its 3D Vision Kit includes software that converts “hundreds” of standard 2-D games to 3-D, including popular titles like Call of Duty: Black Ops, Batman: Arkham Asylum and Battlefield 3. Price points: Despite the fact that slowing demand for PCs has been pushing netbook and notebook prices down for consumers, 3-D laptop pricing still ranges on the high side. Dell’s Alienware M17x R3 and XPS 17 (with 3-D screen), Toshiba’s Qosmio F755 and the Sony VAIO F 3D all currently retail for around $1,500. The bottom line: laptops with 3-D capabilities tend to be more expensive at a base price. Add in the cost of active-shutter glasses when they’re not bundled in — anywhere from $40 to $150 — and consumers are paying even more. Where does the new HP Envy 17 3D fit in? : The new HP Envy 17 3D does have some nice features, such as a 17.3-inch 3-D, LED Radiance display with full 1080p HD viewing, backlit keys, an upgraded touchpad and a Blu-ray and 12.7mm DVD-RW slot. It runs Windows 7, has an Intel Core i5-2340M processor, and its list price is $1,599.99, which includes one pair of 3-D glasses (it does not work with the Nvidia 3D Vision kit). 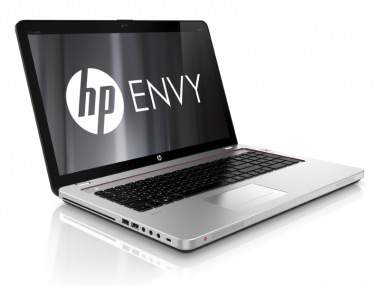 Hopefully, battery life will show improvement from the last Envy 17 3D, which some reviewers complained was short-lived. Readers, what do you think: Would you buy a 3-D laptop?